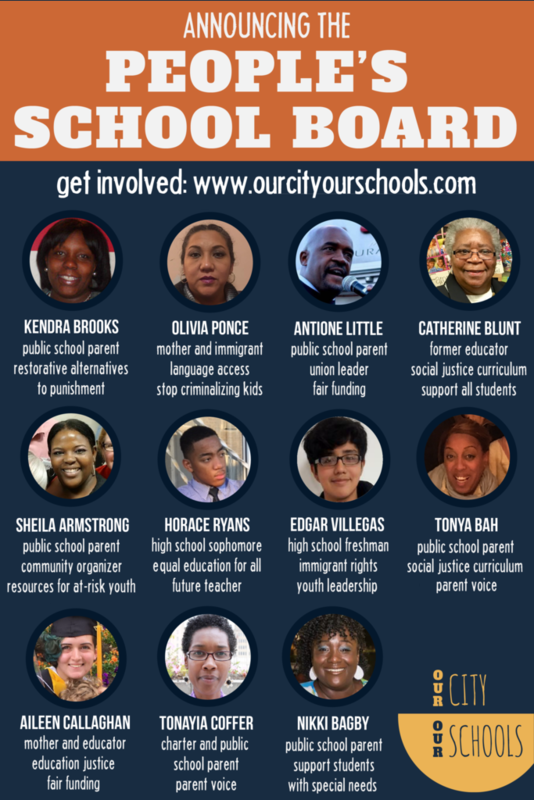 Announcing the People’s School Board Slate! In anticipation of the naming of new Philadelphia Board of Education members, the Our City Our Schools coalition is putting forward a slate of 11 people to illustrate what a true People’s School Board looks like. The slate is made up of true stakeholders of the Philadelphia schools: a majority of slate members are parents with children in both Philadelphia charters and public schools, two are current students, one is a retired educator and principal and one is an immigrant mother. The slate spans the geography of the city and is made up of leaders with a history of organizing for racial and economic justice in our schools. Mayor Kenney’s office has announced that in the next few weeks the nominating committee for school board will be announced. This nominating committee will then present 27 potential names to the Mayor and to City Council which will then be picked from for the new school board. The new school board, as laid out in the city charter, consists of 9 adult members, 1 student member and 1 student alternate.